Planet Coaster has enjoyed a never-ending stream of love from both the developers and players, from the game’s early access launch all the way to now, with the first proper paid expansions finally adding plenty of new quality content and a steady influx of mods making up anything that Frontier Developments can’t handle. So with a consistent stream of updates and patches coming our way on a regular basis, it’s best we keep the changes centralized in a single post for us to update – and for you to bookmark – as they roll in. The Patch Update v1.8.2 has now been released. 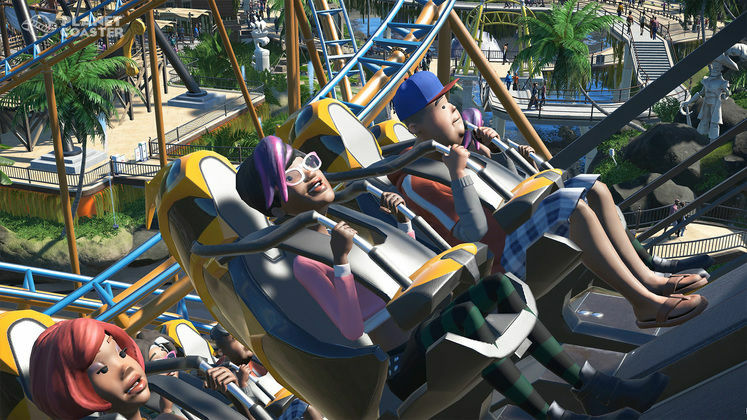 The latest update for Planet Coaster brings it up to version 1.8.2 and adds lots of general fixes, including ones for scenery, rides, UI, Audio and Staff, Guests and Facilities. This patch doesn’t add any new content, but you can check out the full patch notes here. Following the massive Anniversary Update released earlier this week (see below for details on what it added to Planet Coaster) we’ve had a couple of smaller updates for the game. Most of these involve resolving crashes, but there are also colour fixes too for the true artists out there. Here’s what both the 1.4.2 and the 1.4.1 patches add to the game. Resolved a crash that could occur when entering the Career menus. Resolved a crash that could occur when playing videos on billboards. Fixed an issue where selecting objects with the same colour palette could not be recoloured together. Added colour options to the Park Bin so it is no longer white. The Anniversary Update is slightly bigger than the usual seasonal content additions, and brings several fixes, requested features, and thematic options for dedicated park builders. Five new rides – the Weisshorn (a classic fairground ride), the Monte Leone (a small Weisshorn), the Zenith (a hydraulic launched coaster), the Hop The Gaps (a rickety side friction ride), and the Cascade (our first water coaster). Scenario Editor – giving you the tools to create your own custom scenarios and share them with the community through Steam Workshop! Staff Management building – a place for your staff to rest and receive training. A host of picnic benches, themed canopies, and autumn trees – allowing you to create food courts and plazas! Interchangeable coasters – this lets you switch coaster trains to other types of track allowing for maximum flexibility. You will now be able to swap the background of custom biomes as you see fit. This will allow you to create whatever vista you want! We are now allowing for custom text on coasters; whatever you decide to name your coaster will now appear on the coaster car. Some updates to triggers will now allow you to toggle objects for a certain time and at certain intervals (e.g. to create strobe lights). We are also adding some kerbs and barriers to our pathing system to allow you to control the flow of guests. This one actually takes out a feature introduced in the last patch. Swapping coaster trains is apparently a feature that wasn’t quite ready for primetime. Frontier promise to highlight it during Frontier Expo on October 7 – likely alongside the next major season update. It’s finally here: The Spooky Pack, the first decent sized proper paid expansion to Planet Coaster, bringing with it a load of cool new additions – and a brand new update too. To celebrate the DLC’s release, Frontier have even added a brand new Coaster, In-Descent, utterly for free to all owners of Planet Coaster. Now that’s generosity. Improved the Steel Vengeance coaster blueprint to more closely match the speed and height of the ride. Reduced the wear on the Steel Vengeance track. Guests will now get on the Steel Vengeance in the correct order. Improved the lighting on the Steel Vengeance car. 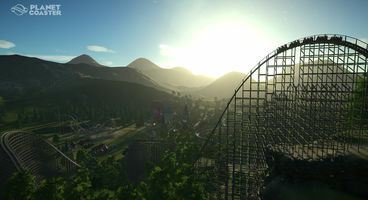 Today’s update adds the world’s fastest hybrid rollercoaster – and it hasn’t even been built yet! Cedar Point’s ‘Steel Vengeance’ arrives alongside decorative signs, blueprints and a few bug fixes. Added the Steel Vengeance coaster, from Cedar Point. Added the Steel Vengeance coaster blueprint for the Steel Vengeance coaster. Added 2 Cedar Point signs and the Steel Vengeance ride sign. Added a prompt to enable extended debugging when a GPU crash is detected. Fixed an issue where display sequencers would not trigger at certain times. Fixed an issue where activation times on display sequencers would reset. Improved the monthly cost feedback for closed facilities. Edges of custom biome parks will now appear correctly on lower spec machines. Planet Coaster sees a tiny bug fix update today that addresses a problem we never knew existed – video billboards now support audio. For the longest time, we thought this was standard, hoping to see some City17 recreations. Now, it can finally become a virtual reality – again. A couple of quick bugfixes to address problems found in patch 1.3.4, it’s the third sweep to come within the week. A number of bug fixes yet again and the swift introduction of a new ride means those wondering whether the Construction Kit had slowed the development of free DLC – it has not! Coriolis – Boasting classic styling and elegantly painted panels, the Coriolis combines exhilarating action with beautiful aesthetics. Manic Mouse – Coasters don’t have to take up a lot of space to offer thrills. ‘Wild Mouse’ coasters delight passengers with tight, unbanked bends that, when taken at moderate speed, generate high lateral g-forces. Today marks the day of Planet Coaster’s first true paid-DLC update. It’s not an expansion of any sort, but a deal between Universal and Frontier Developments mean it’s now a little easier to style your park around the theme of classic media. Straight out of patch 1.3.1 came a handful of bugs. Players were on-hand to report them, and the Planet Coaster team were able to ship out a fix in near record time. A smaller update right on the back of the massive 1.3 patch – and you can probably guess why! Every big patch is going to have a few bugs slip under the cracks, so it’s time to get squashing what was left behind. Here’s the big one – the Summer Update! Bringing fireworks, more controllable rides, custom biomes/video implementation and even more rides for the low, low cost of $0, Planet Coaster really is shining like a star. Fireworks – a new type of triggerable object! Painted Wooden Coasters – White Woody’s are now available! Iron Claw – The Iron Claw is a classic pendulum ride that’s been very popular in many parks around the globe. This extreme thrill ride holds up to 32 guests at a time and swings them 65 feet in the air while the cabin continuously spins. The sensations experiences are zero to heavy downward g-forces as the guests are flung in all directions and almost completely upside down. Sky Watcher – The Sky watcher is a large observation tower that elevates your guests to 138m into the air to give the most impressive vista of your parks and the rotating cabin offers amazing panoramic views. The movement is graceful and is suitable for all ages. The structure is and elegant and beautiful combination of glass and steel and enhanced with a beautiful lighting arrangement this will give your park an iconic landmark for your guests to wonder at. This ride seats up to 60 guests at a time making it the highest capacity of any ride currently in game. Black Out – The Blackout is an extreme inverting swing-ship, and has been inspired by the classic Looping Starship. This ride harkens back to the golden age of when the space race was flourishing. With a capacity to hold up to 50 guests and standing at 22 meters it’s a great major ride for your parks. Power Up – The Power-up is a compact coaster ideal for squeezing into those tight spaces in your park. The train design is very open to offer maximum thrills and exposure to the elements. A vertical lift that takes the train uphill at 90 degrees and then the car then turns another 90 degrees upside down and is released into a terrifying plummet through a heart line roll down into a vertical drop and back through the station, back up the chain-lift again where it the rolls backwards through the station again a couple of times until it’s caught and lowered backwards into the station. A short but brutal ride guaranteed to scare the wits out of your guests. Viper One – The Viper One up is a multi launch, twisted impulse, LIM shuttle coaster that consists of two large towering supports that hold up a 66m inline-roll at each end. As the coaster passes through the station the train get hurled up further up the track with each run until it almost reaches the top of each tower and giving the sensation the the train is going to fly off the end of the track. Gnarler – The Gnarler is a new wooden coaster car to help celebrate the addition of painted wooden supports. The train is adds a more modern wooden coaster train design tom the traditional wooden coasters family. The train chassis are incredibly detailed with stylish and beautifully crafted interior and unique lead car. 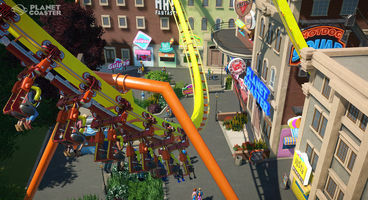 De-Gen and Bolt – Something often requested by the Planet Coaster community was to have the sit-down boomerang coaster car (Trident) to appear on the ‘looping coaster track’ (The American Arrow) and visa-versa. We not only did this by creating two new coasters but we also gave them an upgrade with a new lick of paint and some minor cosmetic tweaks and they look beautiful. Goldmine Tower – Some poor fella bought this mine from a prospector, and took out some big loans to pay for it. Turns out it was a scam. The varmint had salted the mine! Now he’s trying to turn it into a tourist attraction with fireworks and Old West-style streets, but it’s not doing as well as he hoped and he needs your help. Miss Elly’s Diner – Miss Elly’s Diner has some great facilities, including a big wooden coaster for a spot of excitement! But its remote location means it doesn’t see many visitors, and its potential isn’t being realised. Can you build on this location and draw in the crowds? Starship Hanger – They filmed some pretty famous movies out here in the desert. It kind of looks like Mars, don’t it. The place isn’t much in demand any more – it’s all CGI these days – but the company doesn’t want to let it go. They want you to turn it into a theme park instead! Another smaller update comes in with more features than the last minuscule patch. General tweaks and bug fixes remain, but this one has an added new ride – Pathos III. The team is planning an announcement for E3 with a Major Update stream happening the week after. Type to get hyped! Added the winning blueprint from the Go-Karts Competition -‘Princess Amelie’s Castle Karts’ by TrickyPlaysGames. Congratulations! Fixed an issue where The Robotic Arm sign was re-named “Sci-Fi Sign – Robot Arm Small” to be consistent with the naming of the other signs. A ‘small update’, as the Frontier team would call it. This one comes with faster security guards, snappier crime alerts and peeps realising they’ve been pick-pocketed. Crime is increasing! We’ve already detailed a lot of the major features of this patch back when Frontier Developments decided to spend 90 minutes demonstrating the goods before publishing 5-6 videos of each cool new gig. There’s the prompt! It’s Planet Coaster update day. Coming as if from nowhere, Frontier Developments has gifted us the language of Japan with further localisations to follow the Chinese and Korean add-ons introduced with the last patch. Oh. There’s a new flatride, too. The next major update may only be scheduled for April, but at least there’s a new attraction to mess around with beforehand. Guests are now more willing to join longer ride queues. Fixed guests not going down steep stairs in queues. Coaster trains no longer ignore minimum departure interval. Neon signs no longer placed upside down. Triggered effects and music are more audible when on ride and more directional to help reduce bleed through walls (may require pointing the speaker at the ride better). Added park entrance to the Grassland Biome on Hard Difficulty Challenge mode. Fixed Mechanic animation so no longer intersects with control booth when inspecting The Screaminator ride. Guests on coasters will fatigue over time and scream a little less. More dynamic rides will keep them louder, rides that are constantly at a high speed will tire their vocal chords. Triggered soundeffects and park speakers need to be pointed for maximum effect as they are loudest from the front. The relentless bunch that they are over at Frontier Developments quickly snuck out another update early this morning. With the news dropping minutes before the update was deployed, it’s said to simply contain a few bug fixes. Whether this relates to people’s worries that park customers were being a little tight-pursed these days, we don’t know. It was apparently small enough to not warrant any official patch notes and clocks in at a measly 80mb. What it did contain, however, is the date of the commonly mentioned ‘Winter Update’. December 15 is the date to mark, at it’ll bring the community-voted flat ride and a bunch of other festive-themed add-ons to shower your park with holiday spirit. Read the blog post here. The second post launch update is now live and brings with it a number of fixes and stability improvements. There will also be a free winter update coming on December 15th that wil contain new content, so keep your eyes peeled for that. Community translations now support overriding the games font, allowing support for East Asian languages where characters were previously not included. Final Steam achievements. There’s 31 of those shinies, build and conquer! Pre-order bonuses are now available for those with the Trillseeker edition of the game. You can find the soundtrack files in the Steam Music Player. The Planet Coaster Official Soundtrack. Enjoy an hours’ worth of pleasure to your ears! What’s better than the normal Coaster King mascot? The Golden Coaster King mascot! And again. Less than 24 hours before the final release, at around 5pm GMT, an announcement post by BrettC_Frontier pops up on Steam letting them know that a 2.3GB update is here for their testing pleasure. There’s far less when it comes to varied improvements here, but they’re consolidated into a few short categories. Lets hope you don’t have a download cap, because Frontier seem to like pushing more through those pipes. How you can manage to put out another update so close to launch is nothing short of sheer commitment, but that’s exactly what Frontier have managed. Maybe it’s a way to stagger the release of the complete 1.0 version to have people download the build in chunks over the pre-launch days, or maybe they’re really just that quick on improvements. Either way, Beta 5 is here, and it’s thankfully short. More Shop news: Themed hats, mayonnaise for Monsieur Frites. We have also added a variety of hats to be purchased in the Hat Shops, themed to Western, Sci-fi, and Fantasy; so your guests will have loads more options for funky headwear! Lastly, your guests can now choose to top their fries with… mayonnaise (YES, HOLLAND REPRESENT! ), to give them the best of flavours at Monsieur Frites shops. More optimisations: the team has been working hard over the last few weeks to get framerate up even further for a smooth experience, and today’s update has the latest fruits of their labours. And last but not least, by popular demand, your PARK AREA IS NOW OVER 2.5 TIMES BIGGER THAN BEFORE! As a result of the team’s hard work on optimisations, they have increased your park sizes. You’ll have even more space to put down rides, build crazy coasters, and craft intricate landscapes your guests will absolutely love!